TeslaPittsburgh.com: Hermitage / West Middlesex Supercharger CONFIRMED! First of all, let's understand where in the country we are. Hermitage is the nearest town of any size, even though Tesla is calling it West Middlesex. 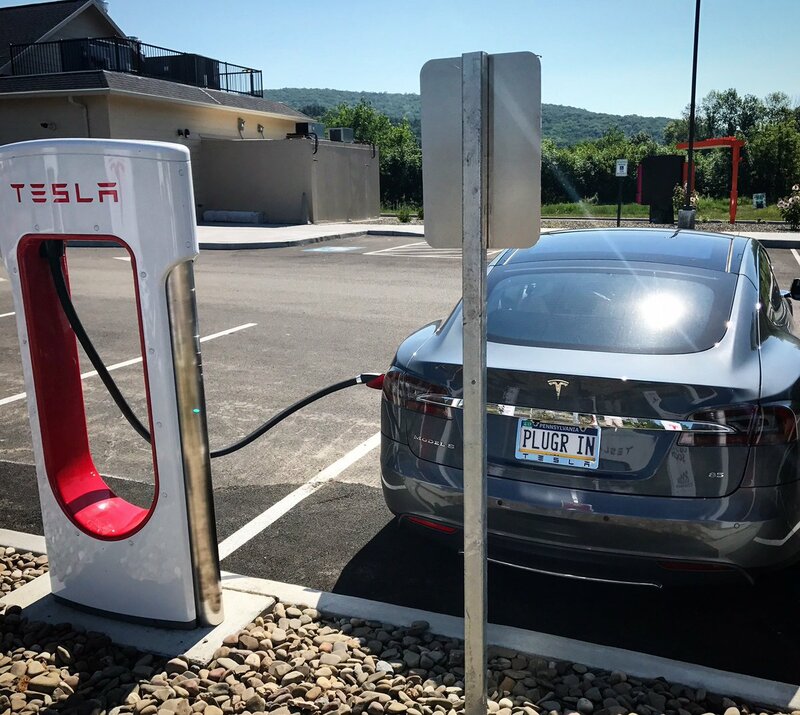 It sits strategically right smack in the middle of a Supercharger crossroads, easily accessible to travelers on I-80 or the turnpike spur I-376 and somewhat less conveniently for travelers on I-79 in northwestern Pennsylvania. Located just north of the interchange between I-80 and I-376 is a Sheetz gas station. 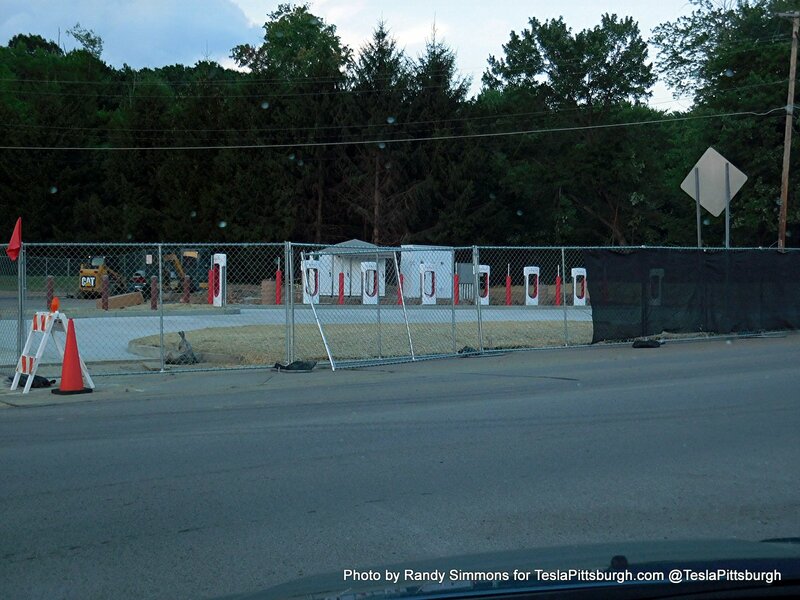 The growing partnership between Tesla and Sheetz has a lot of us in the region quite excited, with other locations in Breezewood, Maryland and West Virginia all simultaneously under construction. This particular Sheetz sits on a corner lot and has a Dunkin' Donuts currently under construction right beside it (visible in the top of the picture). It looks pretty tight for the addition of a Supercharger, with a car wash and few peripheral parking spaces, but there's more going on here than you'd normally see. In pictures sent to me by my father, you can see that construction is already quite advanced. The stanchions are already in place, complete with the plugs/cables and Supercharger cabinets appear to be hooked up to them since there is new concrete already in place. 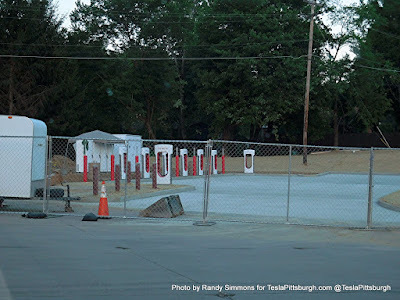 Fencing is still missing (if planned) and we don't know yet if the utility's usual green transformers are on site, a common holdup towards the end of every Supercharger's construction. The new concrete surface is filling the corner of the property farthest from the Dunkin' Donuts, but also far enough from the Sheetz store itself that ICEing shouldn't be a concern. The charging slots appear to have their own dedicated parking area-- a rare perk! It appears there will be at least two slots that could accommodate bike racks and/or trailer-towing Teslas. Though somewhat unusually, there's a pair of sideways mounted chargers, one on each end of the row... so we'll have to see how that works out. Sheetz has provided turnaround space, so it should be easy enough to get into any of the eight stalls. "Surprise" Superchargers are always fun when they pop up on Tesla's online maps, but it's even more interesting when nearly complete (or powered on!) locations just seem to materialize overnight. My Dad indicated that main construction started last week, so they moved pretty fast on this project. Here's hoping there are a lot more magic Superchargers popping up in Pennsylvania this year!